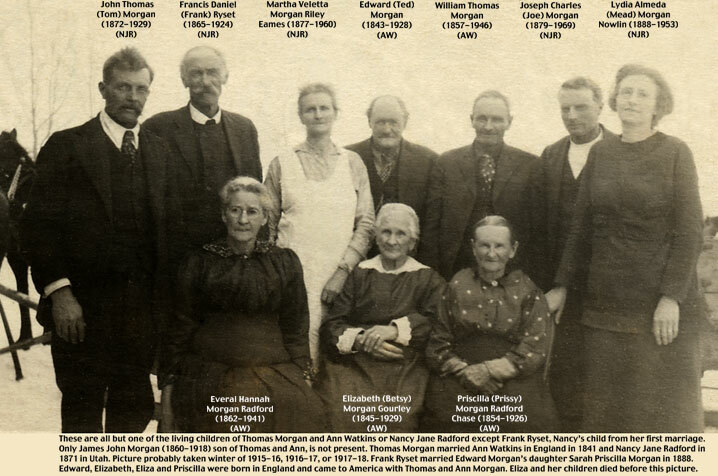 Our Morgan Family Legacy in America was established by the two families that resulted from the marriages of Thomas Morgan to Ann Ollen Watkins in 1841, and to Nancy Jane Radford Ryset in 1871. Thomas Morgan and Ann Ollen Watkins were married in England in 1841. They came to America in 1855, bringing with them four children (Edward, Elizabeth, Eliza and Priscilla). Three more children (William Thomas, James John, Everal Hannah) were born in Utah. Thomas married Nancy Jane Radford Ryset, a widow with three small children (Francis Daniel, Melvin and Don Carlos), in 1871. Melvin died in December,1871 and Don Carlos died in 1873. Only Francis Daniel (Frank) survived to adulthood. Thomas and Nancy Jane had 9 children, only four (John Thomas, Martha Velleta, Joseph Charles, and Lydia Almeda) survived to adulthood. 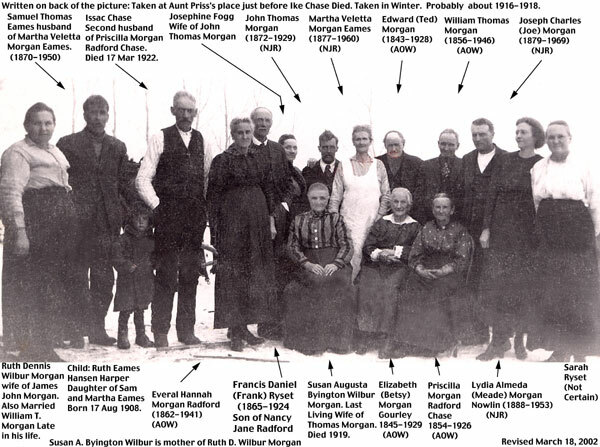 This picture, taken in the winter of 1915-16, 1916-17, or 1917-18, was clearly an attempt by the author to bring together all the living children of Thomas Morgan from these two marriages. Eliza died in 1892. James John lived in the area where the picture was taken but was not present. Other than James John, all the living children of these two marriages are present in this picture. This picture was taken on the same day and in the same place as the top picture. Here the author has gathered not just the Thomas Morgan children, but a number of other inlaws as well. These pictures were taken a year or two after Thomas died at his daughter Priscilla's house near Ririe, Idaho. The last living wife of Thomas Morgan, Susan Augusta Byington Wilbur is present, as is her daughter Ruth Dennis Wilbur, who was married to both James John (Who is not present) and later to William Thomas (4th from right, standing). If the person on the Right Side is Sarah Ryset, as we believe, she was not only the wife of Frank Ryset, but the daughter of Edward (Ted) Morgan. They were not blood relatives, however, as Frank was the son of Francis Frederick Ryset and Nancy Jane Radford. Sarah Priscilla Morgan Ryset was born in 1872, married Frank Ryset in 1888, and died in 1954. To view a simplified chart of Thomas Morgan's children click on the link above. To view a graphic representation of the early Thomas Morgan family click on the link above.